Two contenders are the former TSA head and a former top Justice Department official. WASHINGTON — President Trump is widening his search for FBI director, meeting with two additional candidates to replace ousted director James Comey. 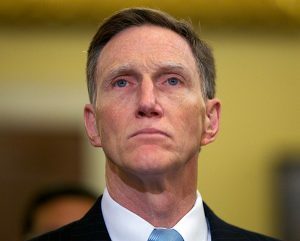 Then-Transportation Security Administration Administrator John Pistole testifies on Capitol Hill in 2014. White House press secretary Sean Spicer says President Trump met with Pistole and Chris Wray, a former top Justice Department official, as possible candidates to fill the job of FBI director. White House press secretary Sean Spicer said Trump was meeting Tuesday with two contenders to lead the agency: former Transportation Security Administration head John Pistole and Chris Wray, a former top Justice Department official who has served as New Jersey Gov. Chris Christie’s personal lawyer. Trump is still on the hunt for a new FBI director three weeks after he fired Comey and expressed hopes of naming a new leader for the bureau before his first overseas trip, which ended Saturday. Before he departed, Trump met with former Connecticut Sen. Joe Lieberman, former Oklahoma Gov. Frank Keating and acting FBI director Andrew McCabe. Lieberman later pulled his name from consideration.